Gallery of cosmetic make-up or features of absolute emotions. If woman is not able to control own emotions by means of mind then accurate cosmetic make-up is necessary in order that unnatural contradictions of visual design of facial features and visible moods would not be appreciable on her face as a result of involuntary emotional changes. 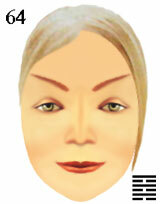 Facial features express absolute or uniform joyful emotions. The person experiences a perfect pleasure. Happy mind realizes realization of desires and satisfaction of feelings as if personal expectations have reached desirable pleasure. Features of absolute emotions in facial moods of women.